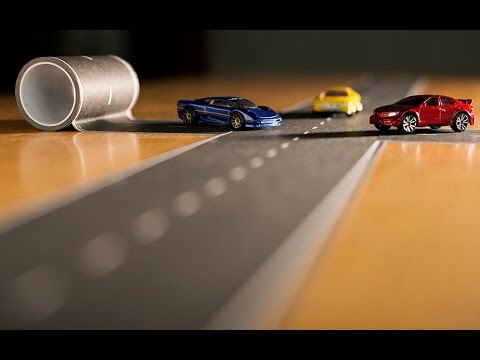 Printed to look like a railroad track, PlayTape Railroad Track is a roll of removable tape that's perfect for playing with toy trains. 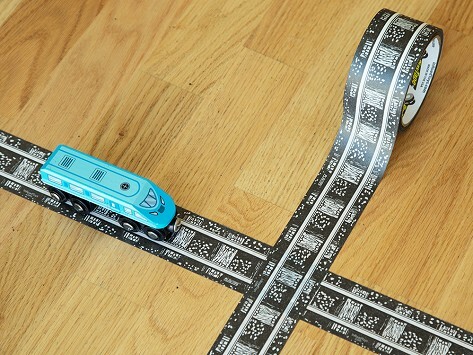 PlayTape is a fast, fun way to lay down instant train tracks anywhere for creative play. Grandson loved the Road Tape so much we purchased this also. Very ingenious way to take your train tracks with you. Can be laid out & picked up repeatedly without a lot to carry & move. My train obsessed 2 year old grandson now has tracks all over his house, including the lip of the bathtub. Tape sticks well but is easily removable.